is a politically incorrect police constable who tells what is happening in Britain today. SAY NO TO 0870 NUMBERS. HAVE BLOG UPDATES DELIVERED TO YOUR EMAIL BOX. Dairy had 27 illegal workers! 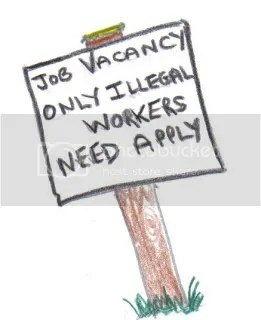 Using a couple of illegals for cheap labour is one thing but to employ a huge illegal workforce of 27 is criminal. Twenty-four people have been arrested following a UK Border Agency raid on a dairy in Acton. Acting on intelligence, officers visited the premises of Freshway Dairy on Eastman Road, Acton in the early hours of Thursday 27 May. The twenty four, all males, were arrested for a variety of immigration offences, including illegal entry, working in breach of their visa conditions, and overstaying their visas. Twenty-two of the men were Indian nationals, while the other two were Pakistani. A further three people, two Indian males and a Pakistani male, were also found to be working illegally. They were escorted from the premises. Meanwhile a third failed asylum seeker from Wolverhampton has been imprisoned for using forged documents to gain employment with a Kidderminster company. Kibumba Kasiala, a 32 year old Congolese man, pleaded guilty to six charges under the Identity Cards Act and three charges under the Fraud Act at Worcester Crown Court on 17 May. He was sentenced to sixteen months’ imprisonment. On 17 November 2009 traffic police officers carrying out a routine vehicle check in Blakedown, near Kidderminster questioned three men two Congolese nationals and a man from Sierra Leone travelling in the same car. Kibumba Kasiala, Ntambwe Nkombe and Mohammed Conde were arrested after officers found two French and one Belgian passport that carried the men’s photographs but the names of different people. Wage slips were also found in the car with names which matched those on the passports. The three men were taken to Kidderminster Police Station where a UK Border Agency fraud investigator and police officers seconded to the agency were on hand to offer advice on next steps. Officers suspected that further immigration offences had been committed by the three men so the UK Border Agency then mounted a full-scale investigation over the next few months. The men were bailed to return to Kidderminster Police Station on 20 January 2010. On that date they were all charged with offences under the Identity Cards Act and remanded into custody. The UK Border Agency investigation had revealed that Kasiala had obtained employment with two companies, using a false name and fake identity documents. Between 18 September and 31 October 2008, he worked for Now Industrial Limited which has since ceased trading. From 20 April to 11 August 2009 Kasiala was also employed by Home Delivery Network Limited, Hoo Farm Industrial Estate, Worcester Road, Kidderminster. During these periods of employment, Kasiala earned a total of £3,387.28 in wages while at the same time fraudulently claiming £2,908.86 in asylum support. Both companies fully cooperated with the UK Border Agency investigation. On 19 April 2010 Congolese national Ntambwe Nkombe, 31, was sentenced to 16 months’ imprisonment at Worcester Crown Court. He was charged with fraud and using false identity documents to secure employment with KSB Recruitment, Birmingham and Staffline Recruitment, Nottingham. Mohammed Conde, 31, from Sierra Leone, received a 14 months’ custodial sentence for an identity card offence on the same date. The UK Border Agency will seek to remove all three men as soon as they have finished their prison sentences.That old chestnut! Acting on intelligence, officers from the UK Border Agency targeted simultaneously Posh Spice, in High Street, Nailsea, and Yatton Tandoori, on High Street, Yatton, at about 18:30 on Wednesday 26 May. At Yatton Tandoori checks on the immigration status of staff revealed that three men had no legal right to work in the UK. The three, aged 25, 28 and 28 and all from Bangladesh, were stopped from working and steps are being taken to remove them from the UK. At Posh Spice, a 29 year old Bangladeshi man was found to have stayed illegally in the UK after his work visa expired. He was arrested and taken to Trinity Road police station, Bristol, where he remains in detention. Steps are being taken by the UK Border Agency to remove him from the country. Both restaurants were served with a civil penalty notice for employing illegal workers. Anyone who suspects that illegal workers are being employed at a business can contact Crimestoppers on 0800 555 111 where anonymity can be assured. Jobs, but no Whites need apply.